The first, and only, cat café has been open for a little while in Stourton-on-the-Hill. It’s named Molly’s after the cat who started it all. Now home to not only Molly but her almost-grown kittens and their daddy, it’s a bustling place. Things get even busier when owner Debbie’s broken-hearted sister, Linda, shows up. She’s left her husband and needs a place to stay. Oops, did she forget to mention she has a dog? The flat is right above the café so with three adults (Debbie’s daughter is there, too) and a dog and a number of cats, it’s quite crowded. The holidays are coming on and there’s just too much to do. Linda is addicted to shopping. And whining. Debbie puts her to work in the café where she promptly starts making changes. Unwelcome changes. Like a row of dominoes falling over, one change leads to another which leads to resentment and anger, but no one wants to start a fight. It’s typical family stuff but in a confined space—and the holidays just add more stress. The story is told from Molly’s point of view. The cats talk to each other but not to people. Molly is in no better shape than Debbie. 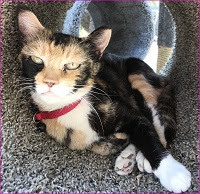 A new cat arrives on the scene and garners a lot of attention for her good looks. Linda wants to make her the draw for the shop, displacing Molly. In the end, Molly and Debbie both need to learn to speak up for themselves and to not jump to conclusions. A fun, quick read, a perfect gift for a cat lover, this is a tale of families, human and feline. There is no mystery, no murder, no treachery, just a lot of misunderstandings that can all be solved by listening to one another. This is the second in the series, first published in England and now available here. 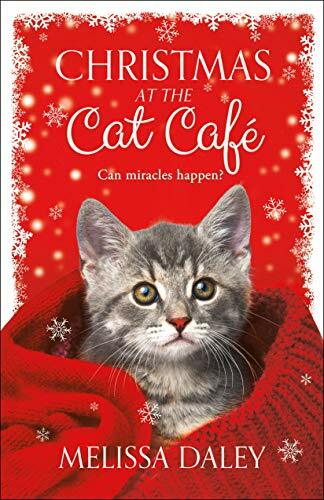 To enter to win a signed copy of Christmas at the Cat Cafe, simply email KRL at krlcontests@gmail[dot]com by replacing the [dot] with a period, and with the subject line "cat cafe,” or comment on this article. A winner will be chosen December 15, 2018. U.S. residents only.If entering via email please include your mailing address (so if you win we can get the book sent right out to you), and if via comment please include your email address. You can read our privacy statement here if you like. I love, love, love the cover. I'm not familiar with Melissa Daley and her books so it was a pleasure to be able to gather knowledge about her and her book. Even better that Melissa's book involves a cat cafe. This crazy cat lady would love to read this! Adorable cover!